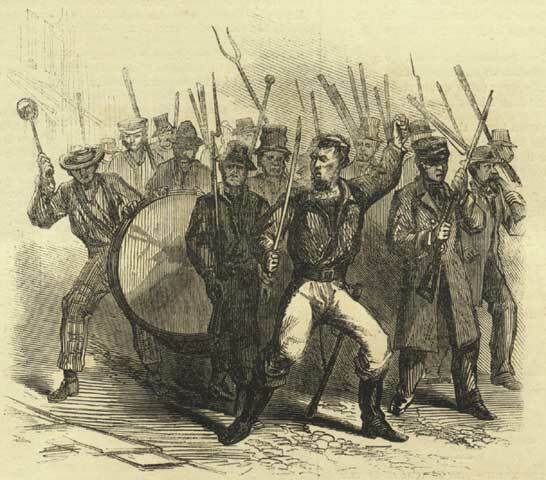 From the Irish Times, "Shame of the fighting Irish: The New York riots against Lincoln’s draft in 1863 revealed a deep racism in Irish emigrants," by Keith Duggan, on 6 July 2013 -- Whenever Peter Quinn finds himself walking where Fifth Avenue intersects 43rd and 44th Streets, he thinks of the flames shooting through the windows of the Colored Orphan Asylum. Of all the atrocities carried out by the Irish crowds during the draft riots in 1863, the burning of the orphanage ought to have been an unspeakable low. Whether by some momentary restraint or pure luck, 233 terrified children were rescued. There was one fatality, when a desk flung from an upper window struck a bystander on the street. That was at 4pm on July 13th, the beginning of five days of hallucinatory violence. The cause of the fury was the first draft lottery, issued by Abraham Lincoln, calling for 300,000 men to help the Union war effort. An exemption cost $300 at a time when the average working wage was $1 per day. On July 11th, at Third Avenue and 46th Street, 1,236 names were drawn for the draft, most of whom belonged to the Irish working class. By dawn on July 13th, many thousands had gathered to protest at the system. Irish immigrants feared a Union victory would see a proliferation in black labour, and a blind hatred towards the black community led to a series of barbaric attacks. They attacked the draft offices, the homes of the wealthy and the offices of the Herald Tribune and New York Times. One man was hanged, another beaten to death. A crippled black coachman was hanged from a lamppost, and the crowds shouted the name of Jefferson Davis, president of the Confederate South. A white prostitute was attacked because she had black customers. “The Irish were seen as a problem from the moment they began arriving. You had one million people arriving here in the decade after 1845,” says Quinn, who has written fiction and non-fiction about what he terms as “the most violent episode in the history of New York until 9/11”. It was as if the Irish rioters had decided that if they were to be considered contemptible by the New York ruling class, they might as well behave as such. If there was logic in some of the targets – the newspapers because of their virulently anti-Catholic, anti-Irish attitudes, the rich because of the draft exemptions – the targeting of the Afro-American community was inexplicable. Thousands, including women and children, gathered outside the orphanage to watch it burn. It took the returning 65th and 7th cavalries, exhausted after the extremes of Gettysburg, to quieten the protesters with brutal efficiency. Did you consider using the ultimate Bitcoin exchange service: CoinMama. Earn free satoshis from CLAIM BTC Faucet. 21 to 57 satoshis every 20 minutes. If you are trying to buy bitcoins online, PAXFUL is the best source for bitcoins as it allows buying bitcoins by 100's of different payment methods, such as MoneyGram, Western Union, PayPal, Credit Card and they even allow exchanging your gift cards for bitcoins. Have you ever tried maximizing your free bitcoin collections by utilizing a BTC FAUCET ROTATOR? Join 1,000,000's who have already found easier strategies for investing in Ripple.